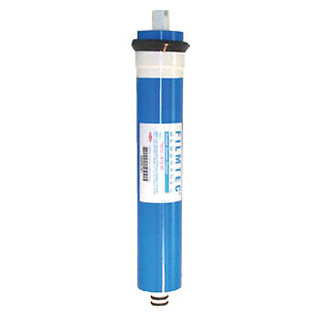 Dimensions: 11 7/8" x 1.8"
DOW Filmtec BW60-1812-75D Reverse Osmosis Membrane. High Rejection rate (HR) of 99%. Processes 75 gallons per day. Filmtec TMF-75 RO replacement water filter membrane that fits many standard RO systems. TFM / TFC stands for "thin film composite" membrane, replaces standard TW30-1812-75 membrane. Alt. Part Numbers: 92022, 114731 , Filmtec 339146. TFM-75 Reverse Osmosis membranes will fit many Reverse Osmosis systems that use standard TFM membranes between 24 and 150 gallons per minute. Filter model: DOW Filmtec BW60-1812-75D TFM75 membrane, High Rejection. Fits following Brands: Dow Filmtec, GE Osmonics, PENTEK, U.S. Water ( US Water ), Culligan, Ametek, US Filter, American Plumber, Kinetico, Watts and more. This membrane will NOT fit some systems that use shorter membranes, such as Sears / Kenmore Ultrafilter and Whrilpool RO systems that use shorter TW30-1810-75 , 10" membranes. There are no Comments or Reviews for this product.